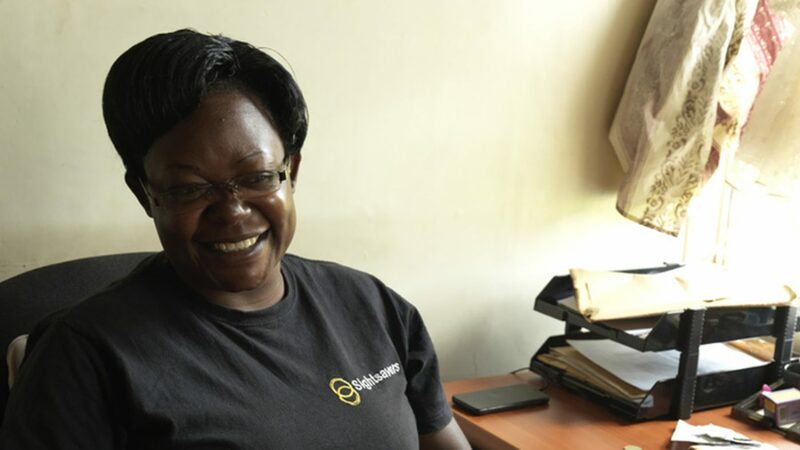 Edith Kagoya is the programme manager for Connecting the Dots, a Sightsavers and EU-funded project running in four districts of the Bunyoro sub-region of western Uganda. Over the past four years she has helped 324 young people with disabilities to complete vocational training and gain employment placements. 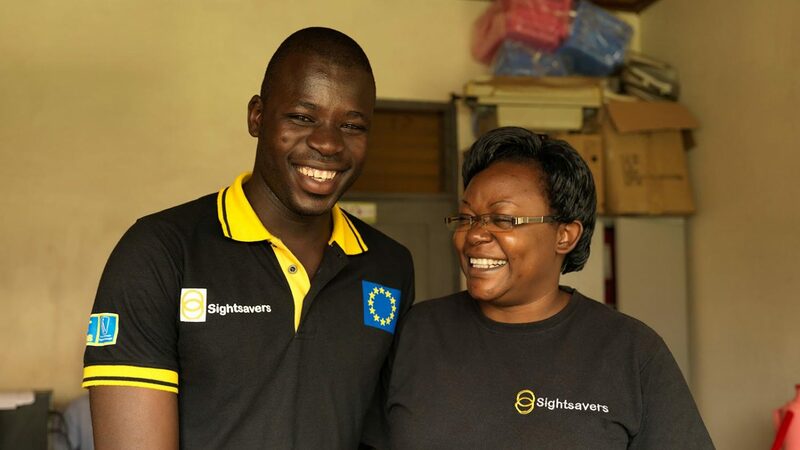 Although Uganda has extremely high youth unemployment, nearly all of the Connecting the Dots students are currently employed or self-employed, thanks to support from the programme. Here, Edith tells her story. Edith with Atugonza, one of the graduates of the Connecting the Dots programme. When I was young I wanted to be a medical doctor. But my family said: “No, we need an artist in the family.” At school a career guidance counsellor asked me what I wanted – she told me it was too late for me to treat [people] with medicine, but she said you can treat people in another way. So I really hoped that I would work with people who had problems and I would heal them and make them happy. I studied a bachelors degree in social work, then began working in the field in community programmes for HIV and gender-based violence prevention. 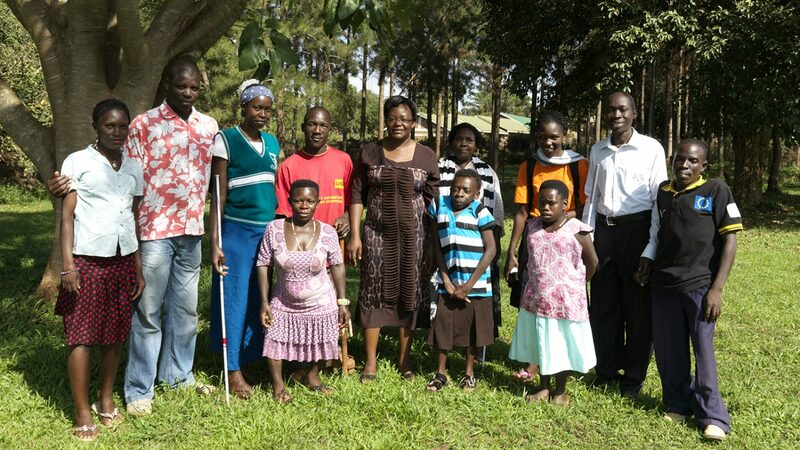 Then I read about Sightsavers’ project and I took on the challenge to work with people with disabilities. The programme is called Connecting the Dots because young people with disabilities in our communities are like dots – they stand alone, on their own. This programme has come in to connect these dots so they are attached to each other, have a relationship with each other, so they are one in a community. 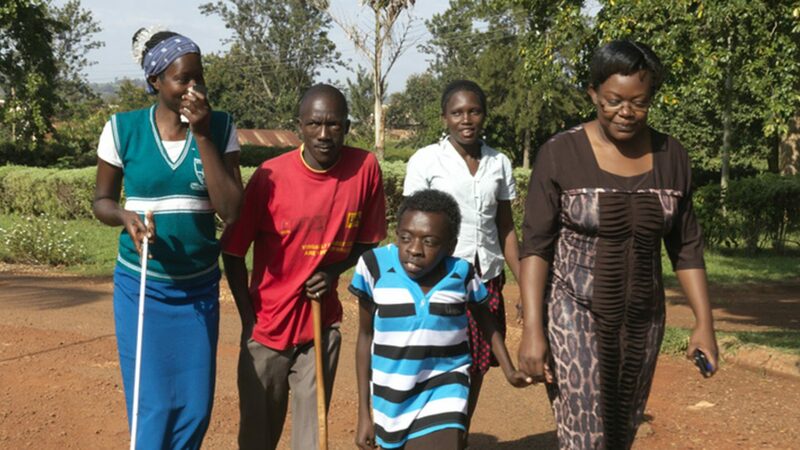 What has the situation been like for people with disabilities in Uganda? Here in Uganda the general attitude was negative. People with disabilities were nicknamed ‘kateyemba’, meaning ‘the unable one’ – they can’t help themselves. If you’re called ‘kateyemba’ in Uganda, it makes you feel hopeless. The attitude has been very negative, until recently when people have seen what people with disabilities can do. In the African culture, if you bear a child with disability it seems like a curse. So parents say: “What did I do to deserve such a child?” That alone affected the way people were looking at people with disabilities. It’s ignorance. Before, they didn’t know a disability is just something affecting the body but that inside the emotion remains is the same – the feelings are the same. Generally, unemployment is a challenge in Uganda so if it’s a challenge for even people without disabilities, for it’s even worse for those with disabilities, with the background of the attitudes that people have. At first, parents did not want their children to come to us for training. Previously there have been… killing people [who have disabilities] as sacrifices. So when this project came in with the idea of taking away a child for boarding for three months, some parents had that kind of hesitation. So the intake was low in year one. How did you make more people aware of the programme and encourage them to sign up? We’d use radio talk shows, community government officers, local leaders, chairmen of disabled people’s organisations. We’d get them to talk about this project, its objectives and what the goal of the project is. And so when we created more awareness, that challenge of low intake disappeared – instead, we got an overwhelming response. How have you seen students develop as they go through the programme? Before, some of them were shy, some of them felt they were isolated. They would want to sit alone, they would not want to associate. But for the time that we’ve been together, they have started opening up, they’ve got friends. I’ve seen them change, find happiness or joy, or feel they’re hopeful. Rita was so reserved before – very reserved. She would sit in one place and you would not even hear her voice. But now she can laugh and make fun of friends. 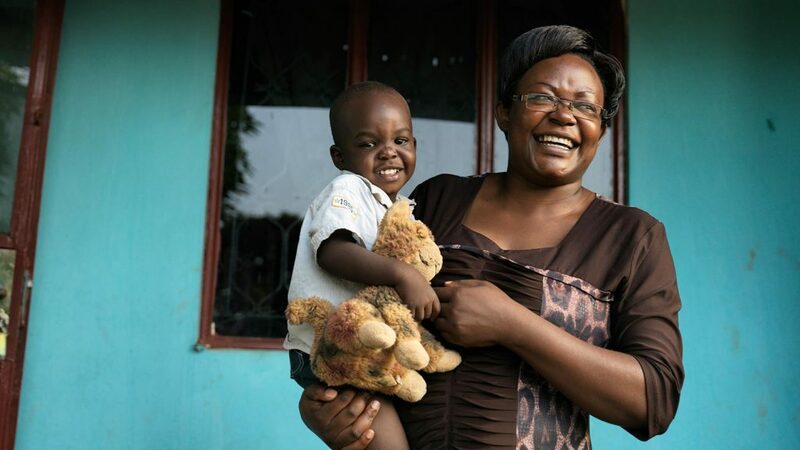 Sylvia joined us at a time when she felt hopeless after losing her sight, because she was disowned by her husband – he took away the children. By the time she joined us she was in that kind of mood: ‘let me try but I know I cannot do anything’. Sylvia has been with the project not more than five months, but there is a great change. She’s now a happy woman, she’s jolly because we’ve shown her she’s a special person. 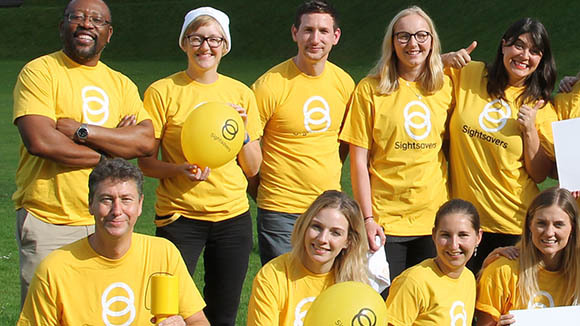 That even when you’ve lost your sight, you are important to other people. Isaac has taken on the challenge of leading others. Right now at his vocational training school he is the information minister, and they call him the master of comedy. I’ve seen him change in a short time and he gives me hope. What is your relationship like with the students? I have three hundred and twenty four children, it is so wonderful, I feel so proud! They call me mum. I feel [they] have a strong feeling or attachment to me just because I’m like a mother to them. When we are together I feel I should embrace them, make them happy because I know back home sometimes such kind of love is not there. They know I’m happy when they’re working, and they know when I find them at their places of work it gives me joy. What impact has Connecting the dots had on the community? The attitude of the community right now, I see it changing. Before, [employers] would not agree. Some people would say we can’t manage to have [employees with disabilities], customers will run away. But right now we see employers accepting these youths well in their businesses and that is an attitude change. And the project did this to these owners of businesses – it brought them forward and trained them on how you can work with a person with disability. And the community, which the owners first of all said would run away, are the ones who come to see what these people can produce. Why do you think Connecting the dots is such an important programme? This programme is so important because it has touched on the most vulnerable group – people who had been neglected but also people who inside themselves felt that they can’t do anything. 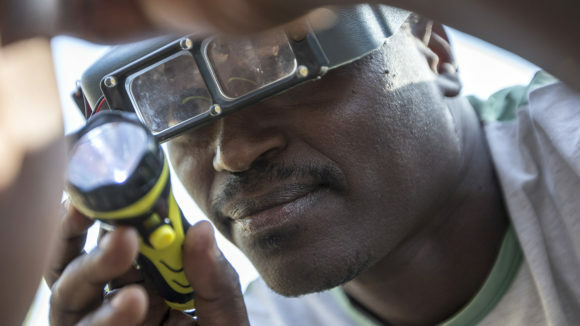 It has empowered them with skills, with knowledge on their rights, and with tools. It has supported vulnerable youth with disabilities right from nothing, to now a level of being something in the community. So I see that as very, very important because when you are empowered with knowledge, you will never be vulnerable and that is the most important thing this project has done. 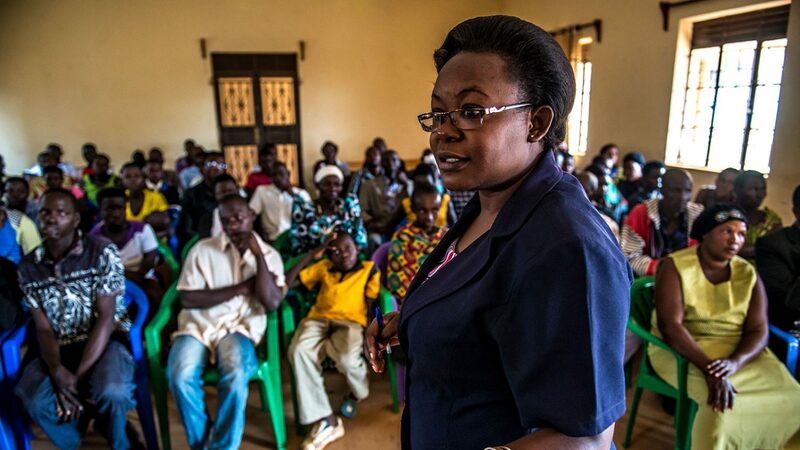 What would you like to see change in Uganda for people with disabilities? I want to see the policies, the sweet policies we have, turn into [reality]. When you read the disability policy it is really wonderful but when it comes to implementation there is nothing. What I want to see changed in Uganda is let the policy match with the programme, let them be implemented. That will really make our country equal. We want to see training institutions inclusive, we want to see facilities, we don’t want to put our youth with disabilities in special schools. We want to see when our youth go through mainstream institutions, let these institutions have sign language interpretation… braille facilities… be physically accessible. If computers are there, let them be talking computers. Recently, we went through registration to be nationals of Uganda. There was nothing to say “If you are blind don’t become a national of Uganda”. No! We are all registered as Ugandans. So if we are all Ugandans we should be treated equally. That is what I want to see change. The European Commission has funded the economic empowerment programme since 2012, and additional funding was awarded in August 2017 by the National Lottery Community Fund. 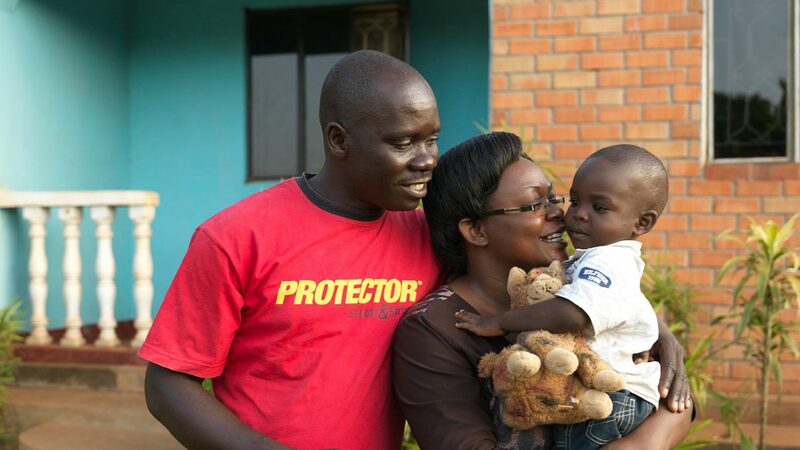 This generous support has helped to transform the lives of hundreds of young people with disabilities in Uganda. Edith with Joseph, one of the Connecting the Dots students. 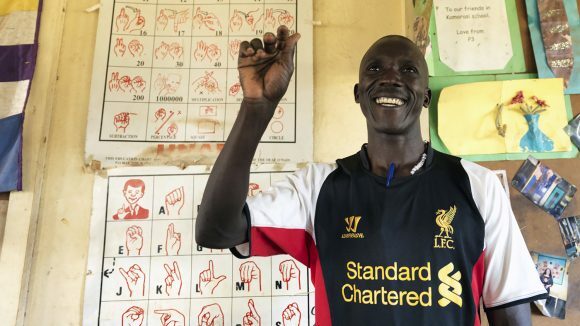 Joseph is the only staff member at his school in Uganda who knows sign language, so he sits with children who have hearing impairments and signs for them.